MÜNSTER, GERMANY, December 3, 2013: A concept that combines screen changer and gear pump on a single movable cart simplifies deployment of these components in an extrusion line, takes up less floor space than separately mounted machines, and provides easy access for replacement of filter media, it was announced today by Nordson KREYENBORG GmbH. 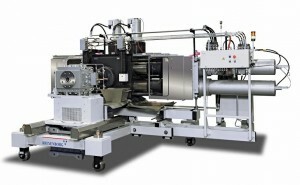 Developed at the request of one customer, the concept of a single support cart can be applied for equipment custom designed by Nordson KREYENBORG for other companies, including extrusion processors, compounders, and recyclers, replacing the standard configuration involving separate carts for screen changer and gear pump. The single cart is mounted on fixed casters that permit transverse-direction movement into and out of the extrusion line, while precisely aligned movement in the extrusion direction is provided by rails installed on the floor. At the same time, linear guides on the cart permit independent extrusion-direction movement of the gear pump and screen changer. To save space and facilitate access for changing screens, Nordson KREYENBORG has in effect turned the gear pump onto its side so that its drive can be mounted below the pump. The rate of coolant flow is adjustable, and the coolant may be either air or de-mineralized water. Customers are asked to specify the coolant in advance so that Nordson KREYENBORG can design the gear pump for optimal performance. If the material to be processed is shear-sensitive, Nordson KREYENBORG recommends its Type 03 gear pump to minimize residence time. Photo Caption: Compact single-cart configuration designed for a recycler of PET includes Nordson KREYENBORG’s Type GPE 140/140-03 gear pump and Type K-SWE-280-4K-75-V/RS screen changer, plus the requisite adapter. Gear pump accommodates throughput of 4,000 kg (8,800 lb) per hour. Screen changer has a filtration fineness of 40 microns (0.0016 in. ).